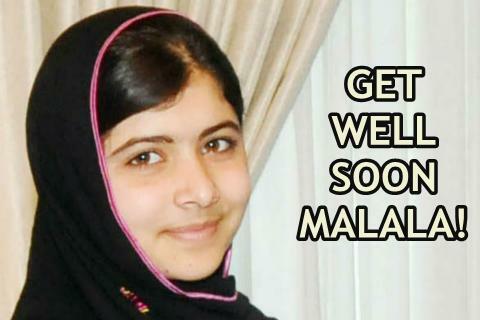 The Islam Awareness Blog: Get well soon Malala! Everyone please pray for Malala, she is a true heroine of our times. "If you educate a man, you educate one person. If you educate a woman, you educate and liberate a whole nation." Malcolm X.
Sabbiyah Pervez is a voice from Bradford on the shooting of a brave young woman. As a young third generation British Asian girl growing up in Bradford, I encountered this backward mentality directed to my parents from some within my own community. Many stated that I did not need to be educated. Instead I should be educated to the bare minimum and be married off at an early age in order to remove myself as a burden from my parents. Others argued that if I was educated "too much" I would become difficult to control and education would grant me "too much" freedom, it would be hard then for me to conform to the expectations many had set for me. Fortunately I can tell you they were right. My education educated and liberated me, it allowed me to critically analyse the problems that i saw around me and to openly question and challenge them. My questions brought discomfort and I was regularly cautioned by elder members of my community for asking "too many questions." Unfortunately, I know of many girls here in the UK, who are pulled out of school because education is seen as a threat to what their elders expect of them. So in a sense I can understand why the Taliban banned the education of girls when they took over the Swat Valley. They, like my great uncle and many others in Pakistan, felt threatened by the effect of educating a girl. You see Malcolm X pretty much has summed it up for us. When you educate a woman, you don't just educate her, you liberate her. You allow her to travel on a path of self-discovery and you enable her to question her position in society. You empower her by giving her knowledge of what she can become. And this is dangerous. It is dangerous to the Taliban because it means that they will not be able to impose their patriarchal laws upon liberated women, it means that if they do they will be presented with a challenge and a force greater then them. And their rule will be effectively be diminished. It was a threat and a risk they couldn't take.